Los Angeles is still one of the most dangerous cities for pedestrians. In Los Angeles, pedestrian accidents have continued to rise over the past decade. When a pedestrian is struck by a car or other motor vehicle, he or she is much likelier to suffer serious injuries or to be killed. More people are choosing to walk to work or school. At the same time, there are more vehicles that are traveling on the roads, driving up the number of these types of accidents. If you have been seriously injured while you were walking, or your family member has been killed, it is important for you to talk to an experienced personal injury attorney. Accidents involving pedestrians in L.A. According to the Governors’ Highway Safety Association, the deaths of pedestrians increased by 27 percent in the U.S. between 2007 and 2016. During that same 10-year period, other types of traffic fatalities fell by 14 percent. During the first half of 2017, California had the dubious distinction of being first in the nation in the number of pedestrians who were killed. During those six months, 352 pedestrians were killed in California. By comparison, Wyoming and Hawaii only had one death apiece during the same time period. In 2016, Los Angeles County had the highest number of pedestrians who were killed during the year at 265. Orange County was ranked at 10th in the nation with 63 fatalities, and San Diego County was ranked at 7th in the U.S. with 71 deaths. The other counties that were in the top 10 were all located outside of California. In the city of L.A., 135 pedestrians were killed in 2017. Between 2015 and 2017, these types of traffic fatalities increased by 80 percent in the city. Experts have identified several factors that have contributed to accidents with pedestrians. They point to the fact that pedestrians and drivers alike may be distracted by their smartphones and fail to see each other. There are a greater number of people who are choosing to walk to their jobs. At the same time, motorists are also driving more. The Governors’ Highway Safety Association has also found a correlational relationship between recreational marijuana legalization and accidents involving pedestrians. Finally, 70 percent of these types of accidents happen at night, which points to the idea that pedestrians may be hit by cars when motorists are unable to see them. L.A. is working to reduce the risks of accidents involving pedestrians by increasing the enforcement of speeding laws. An advocacy group called Los Angeles Walks is pushing for some structural changes that it believes will help to reduce the number of fatalities and serious injuries to walkers. The group wants changes that will force cars to drive slower in areas that have a lot of pedestrians. It is also pushing for automated tickets to catch drivers who are speeding, something that is not legal in California. 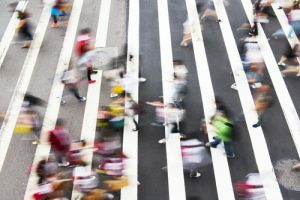 The GHSA’s study recommended that cities install more beacon-flashing signs at the crosswalks of large intersections and the installation of more islands for pedestrians so that they can cross halfway across streets at a time. The GHSA also recommends that cities install more sidewalks so that pedestrians are not forced to walk on the shoulders of the roads. Among the pedestrians who were killed, 33 percent were intoxicated at the time of their accidents. People can help reduce their risks of being struck by cars by drinking less or avoiding walking after they have drunk alcohol. If people are walking at night, they should wear brightly colored clothing, use reflective tape on their clothes and carry flashlights so that they can be seen more easily. They should also try to stay on sidewalks and should only cross the roads at intersections or in marked crosswalks. Both drivers and pedestrians should avoid looking at their cell phones while they are driving or walking. Drivers should always pay attention to pedestrians that they see walking on the sides of the roads and should be prepared to stop if the pedestrians suddenly begin crossing the streets. They should never pass cars that have stopped at crosswalks to allow pedestrians to safely cross, and they should refrain from speeding, distracted driving and impaired driving. Both drivers and pedestrians in California have certain duties of care that they must follow. When pedestrians are crossing at marked crosswalks or at unmarked intersections, drivers have the duty to yield the right-of-way to them. When drivers are approaching crosswalks in which pedestrians are crossing, the drivers have a duty to slow down so that they can safely cross. Pedestrians also have some duties of care in the state. They are not supposed to step off of a curb and into the path of a vehicle that is too close to safely stop. Pedestrians are likewise not supposed to cross so slowly that they unreasonably impede traffic. In situations in which the pedestrians violated their own duties of care, the drivers still have the duties of care to exercise reasonable care so that the pedestrians can cross safely in marked crosswalks or at unmarked intersections.